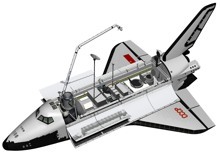 The purposes of the Buran space shuttle were formulated for the first time in the specifications of the universal space system, written by the central headquarters of the spatial means of the defence Ministry of the USSR, and ratified by D.F. Ustinof on November 7th, 1976 (according to certain sources 8). The return to earth of cosmonauts and miscellaneous loads. At the end of the 60s and at the beginning of the 70s the USA began to study the possibility of doing hostilities in space. In the USSR this idea appeared in 1976 from the instigation of the Central committee of the Communist Party of the USSR and the Cabinet of the USSR (Study of the possibility of creating a weapon for the conducting hostilities in space). The works were entrusted to NPO Energia. In the years 70-80 were led the studies with the aim of defining the tasks to annihilate military spaceships, missiles in flight, as well as air, ground and maritime objectives, both at the level of the means of production and financialy. 2 spaceships was elaborated on a common base to fight spatial military objects, equipped by various types of weaponry, laser (as "Skif") or of rockets (as "Cascade"). The base of 2 devices became the unified block of service for the orbiting combat space station Polyus 17К ДОС. Unlike the station, the service block had to contain a large number of fuel tanks to be able to make numerous operations in orbit. Putting into orbit those spaceships was supposed to be realized by Buran (during the experiment by "Proton" rocket launcher). Fuel tanks for the refueling were also put in orbit by Buran. To maintain the good functioning of the combat systems during long durations it was planned to send crews (2 people, up to 7 days), including by Soyouz spaceship. Because the "Cascade" vessel is lighter than "Skif" (the laser armament is very heavy) allowed this vessel to take more fuel. Besides, the Cascades vessel must be put into orbit on a low orbit, whereas the second must be put on an average or geostationary orbit. To destroy the enemy missiles quickly and their warheads, NPO Energia planned the use of "Cascade" and its antimissile rockets. These rockets were specially studied in this task and possessed the same characteristics of trajectory and speed as inter-continental missile. A not cryogenic fuel was used for these rocket and the miniaturization of on-board systems made them successful weapons. At the beginning of the 90s due to the change of politics the researches in this domain were stopped, the divisions which had worked on these projects were dissolved. According to other sources the "Cascade" vessel was elaborated by the company of A.E. Nudelmana supervised by NPO Energia. The putting into orbit of "Cascade" had to be made by the Progress vessel. Five flights of "Cascade" were planned for the first stage 1986-88. The factory of the experimental mechanical engineering industries (ЗЭМ) began the manufacturing under the numbers 129, 130, 131, 132, 133. However the project did not reached the flight tests. Vessels are renamed and in 1990 the project is closed. The company responsible for the creation of the laser was "Astrophysical" NPO - Soviet general company of lasers. After the transfer of "Skif" from NPO Energia to KB "Salyut" at the beginning of the 80s the heavy combat station "Skif" is elaborated. In august 18th, 1983, General Secretary of the Central committee of the Communist Party of the USSR Iury Andropov makes the demand that the USSR stops the development of all the space defence systems. However, because of the americans started their strategic project of defence (IDS) the works on "Skif" continued. On May 15th, 1987 the station "Skif-DM" of about 80 t is launched by Energia LV, but gets damaged offshore due to a failure of the propulsion system. For the destruction of important ground objectives was elaborated the space combat station on the basis of the series 17К ДОС and to which was added combat modules. The on-board systems were autonomous and borrowed from Buran. The military load of Buran was elaborated on confidential decision of the Committee of the Communist party of the USSR and the Cabinet of the USSR "Study of the possibility of the creation of weapon for conducting hostilities in space" on 1976. The nuclear bombs must be placed in the payload bay on a rolling drum which would catapult them outside. On the drawing to the left is shown an animation where vessels (or bombs) are stored as in a revolver cylinder. The dimensions of the Buran's payload bay allow the storage up to 5 bombs. Considering the possible trajectories of bombs in the atmosphere (from 1100 to 1500 km) a striking module (loaded with 20 bombs) could destroy any life on a strip of 3 000 km. It is not excluded that if necessary (for example if the attack order was cancelled) the remote manipulator system could reload bombs inside the payload bay for a later use. There is fragmentary informations on the other military aspects of the use of Buran. In particular within the framework of an asymmetric answer to the American program IDS "Star Wars". Buran could be used to put spatial mines and create a curtain of protection against the IDS system. Furthermore, studies were led in the USSR to create orbital clouds "cleaners" of any space ships up to 3 000 km of altitude. Certainly, after this kind of attack the space circumterrestre would have been unusable during some months but this kind of solutions were envisaged during or just before a massive attack between the USA and the USSR. According to the specifications of the Ministry of the defence and the programs made to NPO Energia, several technical propositions and projects were envisaged for the use of Buran. It was planned to use Buran for missions of transport and maintenance of orbital sets. For example, for the assembly and the maintenance of Mir, the return of modules on Earth. Other use was the deployment and the assembly of big structures, for example for spatial antennas, solar panels, etc.... The installation of the radio antenna telescope KPT-30 was also studied to be spread by Buran. The use of Buran is also studied for the takeoff of the heavy experimental stations 91A6-П, big energy-consuming, and also for making scientific and technological experiments. To prevent the technical risks and the considerable damage of the loss of a device, it was suggested to create a redundancy of the on-board devices. As experiments for the second flight it was planned to study the conditions of micro-atmosphere and the characteristics of the irradiations. These experiments were considered as very important. The great energy possibilities of Buran (60 kW) and the level of micro-gravitation (10-4 10-5 g) as well as the other technical characteristics allow to organize on board the industrial production and the delivery on Earth of bio-preparations and semiconducting devices of high cost, such as projects of bio-installations ("Rekomb-2", "Brook-2", "Potok") and technological installations ("Crater - АГ", "Malachite"). 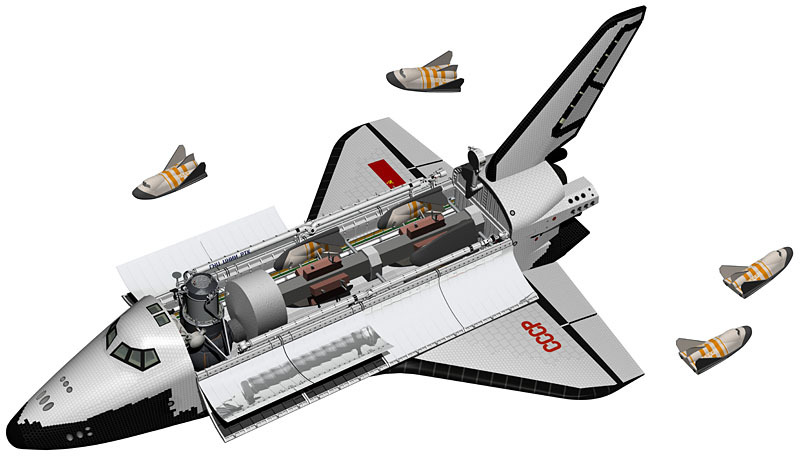 While the Soviets had taken an and commanding lead in the race in the 1950s and 1960s, by the beginning of next decade, they had fallen The Soviet leadership mobilized its aerospace capabilities to create a at least as large and as NASA's Shuttle. The Soviet industry was also undergoing a reshaping in 1974 as the of the deaths of certain players and other bureaucratic maneuverings. 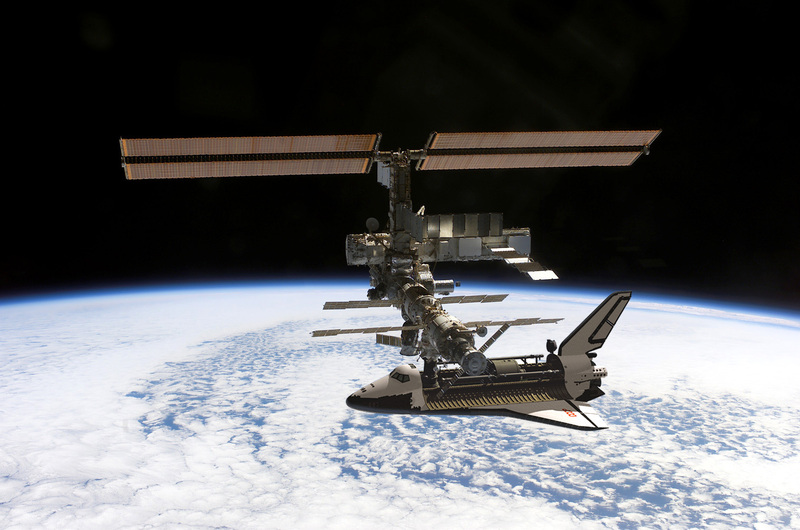 political upshot was that the decided to build a Shuttle to uphold their perceived international than for any specific technical and the project turned out be a technological dead end. In the Soviet Union, some mid-level managers said that the U.S. could drop nuclear weapons on homeland. Thus, they pushed for symmetrical response: the Buran Shuttle. rationale for building an expensive, new spaceflight system may seem paranoid in retrospect, but top leaders embraced it. A major with this thin rationale was the Soviets didn’t really understand the U.S. Shuttle was designed but ended up copying it some superficial ways to assuage political leadership.